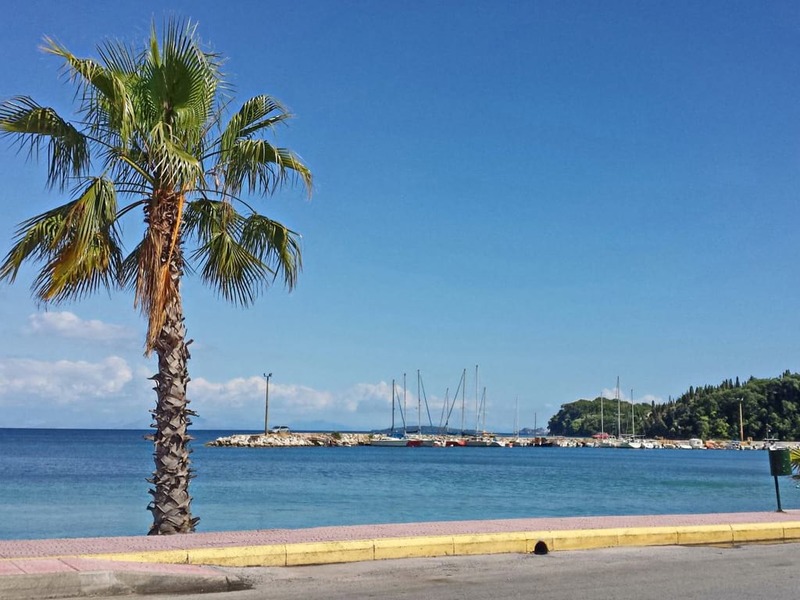 Glyfada is one of the most beautiful and popular beaches in Corfu. Located on the western coast of the island, 16km away from the town of Corfu, this lively, sandy beach will definitely have you coming back again and again to soak up the sun on its stunning seaside. 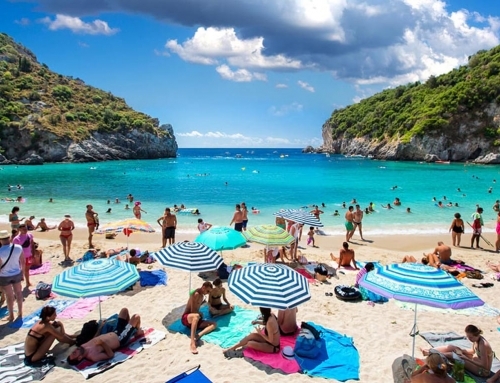 This blue flag award winning beach, covered in soft sand lies beneath lush green cliffs adorned by trees. This imposingly rocky scenery is only interrupted by the golden dunes and crystal clear turquoise waters of the beach of Glyfada. 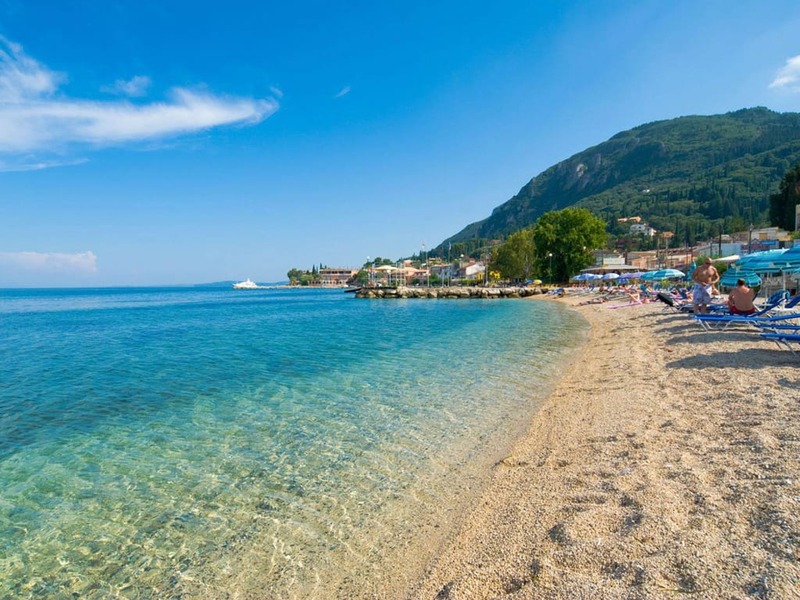 The waters here are shallow and inviting, which makes it suitable for families with children as well. The waterside of Glyfada hosts several organized, fancy beach bars, providing you with shade and comfort during your visit. Combine stunning scenery with relaxing sun beds and water sport facilities, it is no wonder this beach attracts crowds of sun-thirsty visitors! 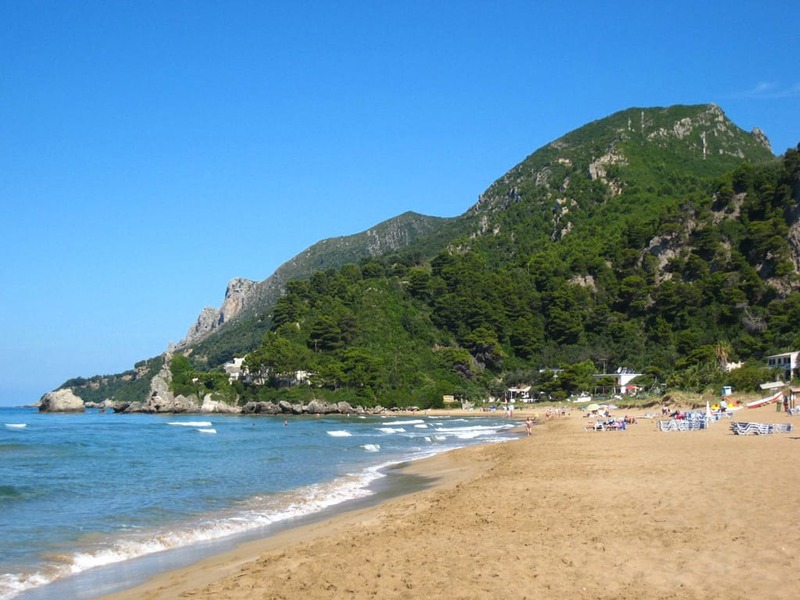 The beach stretches to the foothills of Pelekas. This picturesque village is situated under 4km away from Glyfada, thus offering you the perfect chance to enjoy your meal in one of its traditional Greek taverns, and savor the glorious view of a Corfiot sunset after a long day at the beach on your way home. Pelekas is also popular for its buzzing nightlife, so stick around for a cool drink and a night to remember. If you are all about the views, an even more dramatic natural scenery awaits you in the small bay of Myrtiotissa, north of Glyfada, an unspoiled, hidden paradise owing its name to the monastery standing on the hill above, that you can also visit after a short drive. 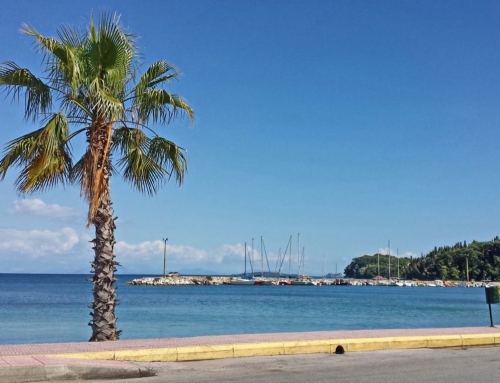 The coastal village of Glyfada offers you quite a few choices to enjoy a chill night out or a traditional Greek meal in the area. Small beachfront restaurants, charming cafes and fancy beach bars are waiting to serve you a refreshing drink and a shaded spot, and even offer you an elegant environment for your afternoon cocktail.